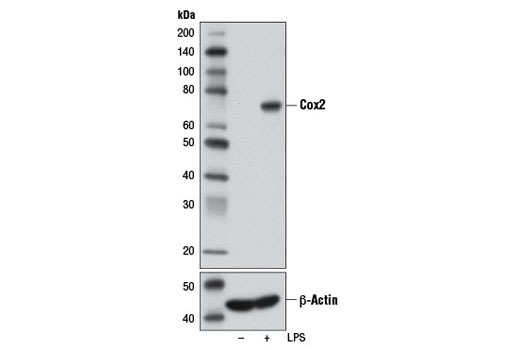 Western blot analysis of extracts from Raw 264.7 cells, untreated (-) or LPS-treated (1 μg/ml, 24 hr; +), using Cox2 (D5H5) XP® Rabbit mAb or β-Actin (D6A8) Rabbit mAb #8457. 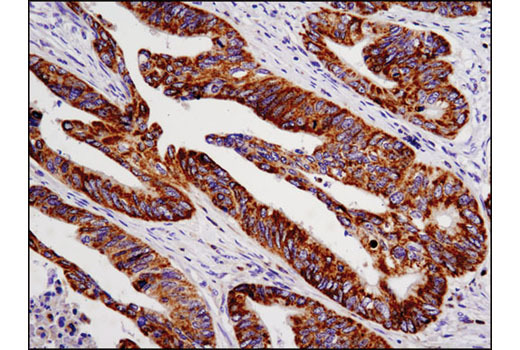 Immunohistochemical analysis of paraffin-embedded human colon carcinoma using Cox2 (D5H5) XP® Rabbit mAb. 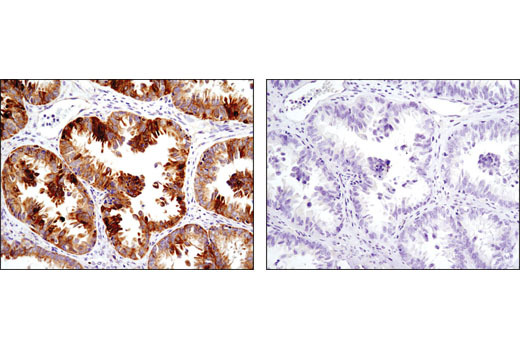 Immunohistochemical analysis of paraffin-embedded human ovarian carcinoma using Cox2 (D5H5) XP® Rabbit mAb in the presence of control peptide (left) or antigen-specific peptide (right). 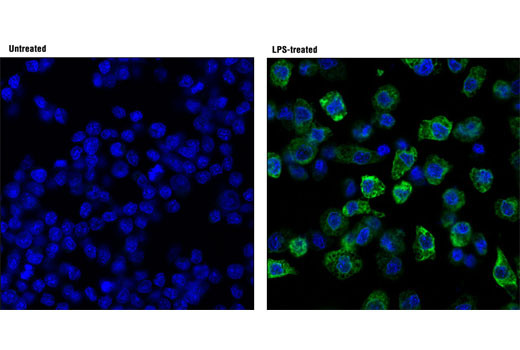 Confocal immunofluorescent analysis of Raw 264.7 cells, untreated (left; -) or LPS-treated (right; 1ug/ml, 24 hrs; +), using Cox2 (D5H5) XP® Rabbit mAb (green). Blue pseudocolor = DRAQ5® #4084 (fluorescent DNA dye). Flow cytometric analysis of Raw 264.7 cells, untreated (blue) or LPS-treated (1μg/ml, 24 hrs; green), using Cox2 (D5H5) XP® Rabbit mAb. Anti-rabbit IgG (H+L), F(ab')2 Fragment (Alexa Fluor® 488 Conjugate) #4412 was used as a secondary antibody. 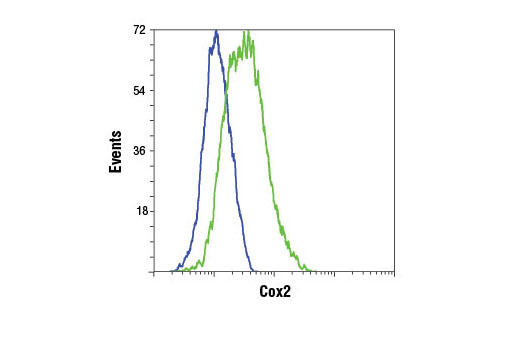 Cox2 (D5H5) XP® Rabbit mAb recognizes endogenous levels of total Cox2 protein. Monoclonal antibody is produced by immunizing animals with a synthetic peptide corresponding to residues surrounding His108 of human Cox2 protein. Cyclooxygenase1 (Cox1) and cyclooxygenase2 (Cox2), family members with 60% homology in humans, catalyze prostaglandin production from arachidonic acid (1,2). While Cox1 expression is constitutive in most tissues, Cox2 expression is induced by lipopolysaccharide (LPS) and peptidoglycan (PGN) (3). PGN activates Ras, leading to phosphorylation of Raf at Ser338 and Erk1/2 at Tyr204. The activation of MAP kinase signaling results in subsequent activation of IKKα/β, phosphorylation of IκBα at Ser32/36, and NF-κB activation. Finally, activation of the transcription factor NF-κB is responsible for the induction of Cox2 expression (4). Investigators have shown that LPS and PGN induce the clinical manifestations of arthritis and bacterial infections, such as inflammation, fever, and septic shock (5). Research studies have indicated that Cox1 and Cox2 may also play a role in the neuropathology of Alzheimer's disease by potentiating γ-secretase activity and β-amyloid generation (6). Xie, W.L. et al. (1991) Proc Natl Acad Sci USA 88, 2692-6. Vane, J.R. et al. (1998) Annu Rev Pharmacol Toxicol 38, 97-120. O'Neill, G.P. et al. (1994) Mol Pharmacol 45, 245-54. Chen, B.C. et al. (2004) J Biol Chem 279, 20889-97. Wang, Q. et al. (2001) Infect Immun 69, 2270-6. Qin, W. et al. (2003) J Biol Chem 278, 50970-7. Onodera, Y. et al. (2015) FEBS Open Bio 5, 492-501.